New Battery Technology Looks to Fix A Major Issue: Doesn’t Combust When Puctured! The threat of an exploding battery has always been a concerning issue. Recently Samsung was under a lot of heat in the wake of the exploding Galaxy Note 7. This was because Samsung rushed in with the Note 7 and stuffed a lot of material like the S-Pen and a massive 3600mAh battery into the somewhat small chasis. This implied that the battery inside had no space for expansion when the Phone heated up under extensive load. This caused the connectors to puncture the battery and since the electrolyte is extremely inflammable, it causes the phone to explode. Even Earlier this week, Samsung’s SDI battery factory caught fire which seriously stresses the need of a new battery technology. 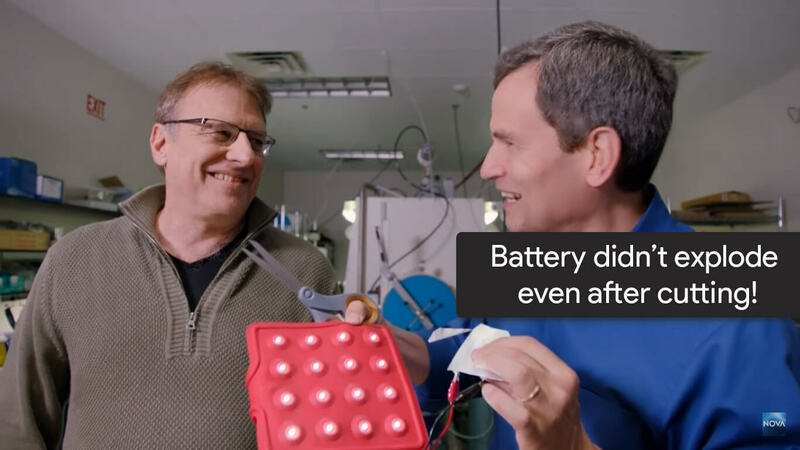 In a new NOVA documentary episode that recently aired on PBS, David Pogue hosts and checks out a next generation battery invented by Mike Zimmerman that won’t explode like the Samsung Galaxy Note 7 even when cut or punctured. More Interestingly, not only is the battery safe to handle while cutting, but also continues to work! Zimmerman, the CEO of Ionic Materials has completely re-invented the current battery technology by replacing the liquid electrolyte(which is highly inflammable) and the connector with a special plastic polymer which creates a completely solid battery. The interesting part is that though the electrolyte is a solid it allows ions to pass through it just as well if not better! Another interesting fact about these batteries is that it is manufactured with the same process by which trash bags and other high volume plastics are manufactured. It also means that the manufacturing cost of the battery would be lesser than the Lithium-Ion or Lithium-Polymer batteries. This amazing battery technology also prevents dendrites from shorting out of batteries which will allow use of a metal electrode which could double a battery’s energy density. While this technology may seem like a miracle, it has its own set of challenges as well. Two of the biggest challenges Zimmerman mentions are reliability testing and how a next generation battery like this will scale. He shares that for this battery to make it to market, they will need some partners who are truly committed to evolving batteries. While batteries involving the above tech may be included in future smartphones, it is safe to bet that we won’t likely see these types of batteries in smartphones for at least a couple of years. Are you ready to say goodbye to Jupiter’s “Great Red Spot”? Travelling at 700 mph (1126 kmph) - Hyperloop: A fiction coming to reality!